The iFLT conference in Cincinnati was amazing! Thank you to Carol Gaab, Teri Wiechart, the whole #iFLT18 and Fluency Matters team for organizing an amazing, unique conference! Next year it will be in St. Petersburg, FL... sign up early! One of the best things about this conference (and others like it) is the Language Labs! Seeing master teachers teach real students with CI is very powerful, particularly if it is a language you don't speak. I was fortunate to see Paul Kirschling (French) and Mark Mallaney (Spanish) teach and it was extremely helpful. The other different thing about conferences like this is the coaching! There are a lot of tracks and people are placed in cohorts with similarly experienced teachers. I was in Intermediate Cohort E with Bryce Hedstrom, Lori (? ), and Kelly Ferguson. Kelly guided my smaller group and coached us as we did mini lessons with other teachers. This is intimidating, but it was also a very validating, positive experience. I was in a great cohort with experienced, knowledgeable teachers, including: Sarah Breckley (AKA Feona, Víctor's wife) and Jadhai Jeffreys. Those two are excellent CI teachers, so genuine, and have such a positive energy that they share! And the third wonderful thing is seeing some of the best, most knowledgeable, passionate, and experienced CI presenters and teachers! It was really fun to see and meet people face to face and get to chat. 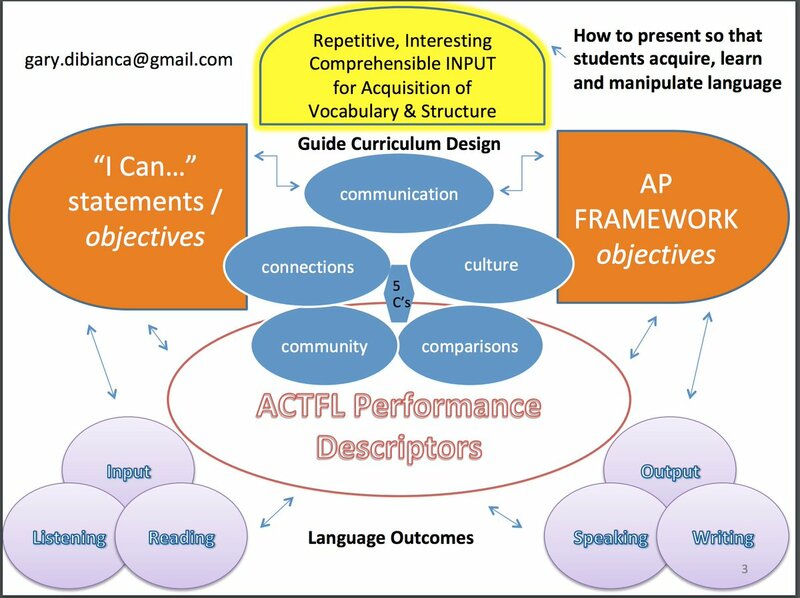 Also, unlike state conferences, regional conferences and ACTFL, everyone here is passionate about learning about delivering Compelling Comprehensible Input and using it in the classroom! And the fourth thing, I got to hang out with my fave, super-smart collaborator and good friend Arianne Dowd all week! We shared an Airbnb together, presented together, ate at some delicious restaurants, and talked about teaching and learning all week! If you can find another teacher to collaborate with, do it. It will change your classroom and make your workload much easier. Leslie Davison is super smart, creative and open minded! I learned about Breakout Boxes from her at ACTFL in 2016. And I knew I would learn about something new, useful, and out-of-the-box at this session too. She shared the UNESCO Go Goals! board game (free to download and use here). At her session, we first talked about the 17 UNESCO Sustainable Development Goals and tried to guess what they were. Then, she released us (outside!) to play the game. There are soooooo many possibilities with these resources! And I hope to share more about what I do with them this school year. Darcy Pippins... finally! I had been to see this session for a while now. Darcy teaches with all CI in all levels, teaches high numbers (50+) of students in AP, and has had 85-90% passing rate for the past 6 years. Impressive and validating! Darcy shared a wealth of resources and ideas. And I have some Embedded Readings too, a few for some songs: Echar Pa'lante, El Niagara en Bicicleta, y La Bestia, and a three that lead to an authentic video of an Ecuadorian legend Las Guacamayas, El Kuychi, and El Nacimiento del Río Amazonas. Since I am a planner and really try ton include AP Themes, the 5 Cs, "I can" statements, Essential Questions, and Culture, I really appreciated Gary's session! He is super knowledgeable, organized, and passionate about teaching and planning. Here is an picture that illustrates some of what he talked about. As you can see, it is a lot, but he did an excellent job tying all of these things together! I will probably share more about this presentation in the future! In the meantime, and as we wait for Gary's blog post (which he promised) about Socratic Seminars, here is one by Arianne Dowd. Becky Moulton is so passionate about using music in class. She shared this quote: "What we learn with pleasure we never forget." She also shared the benefits of having our students sing: is it associated with feelings of pleasure, it alleviates anxiety and stress, it enhances feelings of trust and bonding, and is lessens feelings of depression and loneliness. What more do you need to convince you!?! I will probably blog more about other things she shared, such as Oiga, but for now I will leave you with this gem of a video/song that I can't wait to use! There is an Embedded Reading for it here. I was only in this session for about 15 minutes, but what I saw was excellent! If you teach Heritage Speakers, check out their TPT store (I will link it when I find it)! And finally, in addition to attending, Arianne and I also presented: The Power of Triple Input (Triple = sound, text, and images (#culture). Click here to see part of our presentation here.